Yes, I am posting the first of the Lent-Easter posts. If you don't want to think about that yet, just ignore the posts until you are ready. But, also know that Easter is early this year. Ash Wednesday is on February 13! So, you may want to at least take a peak. AND, after living in Lent for the week, I found the first Sunday of Advent had a richness I had not anticipated. I was seeing past the baby to the Risen Lord in a way that surprised me. So, I almost encourage you to take a side trip into Lent in the middle of Advent - not for the children, but for you. Lent and Easter are the most important seasons of the church year. They are filled with important disciplines and high holy days that are story-focused. They can be claimed and observed by children. 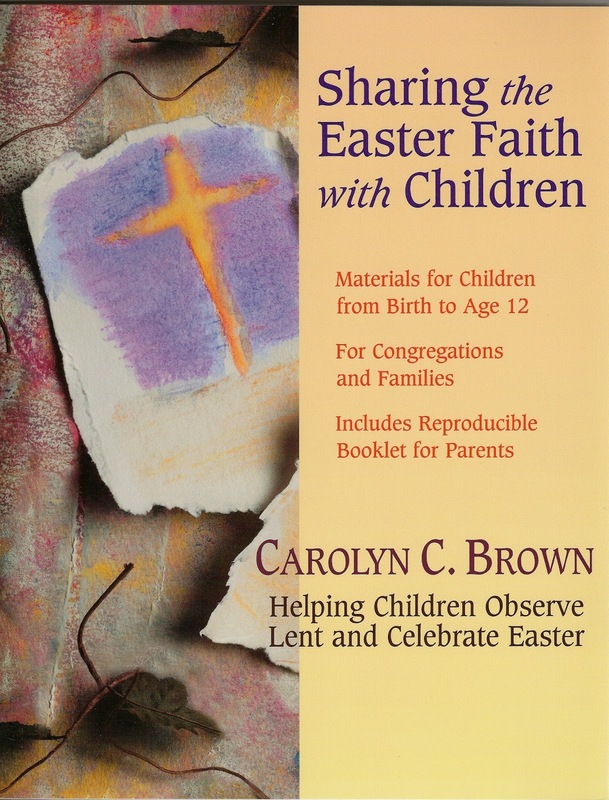 I am so committed to including children in the congregation’s observances of these seasons that I have written a book on the subject – Sharing the Easter Faith with Children. Of course, you need to buy at least one copy of this book! It is filled with both insights into how children understand the stories of this season and practical suggestions for how to include them in the congregation’s observances. I am building on the book in this blog. U For Year B there is a series of crosses related to the texts for each Sunday and high holy day of the season. This might be reworked and related to the texts of Year C. Go to Year B - Observing Lent and Celebrating Easter for the details. 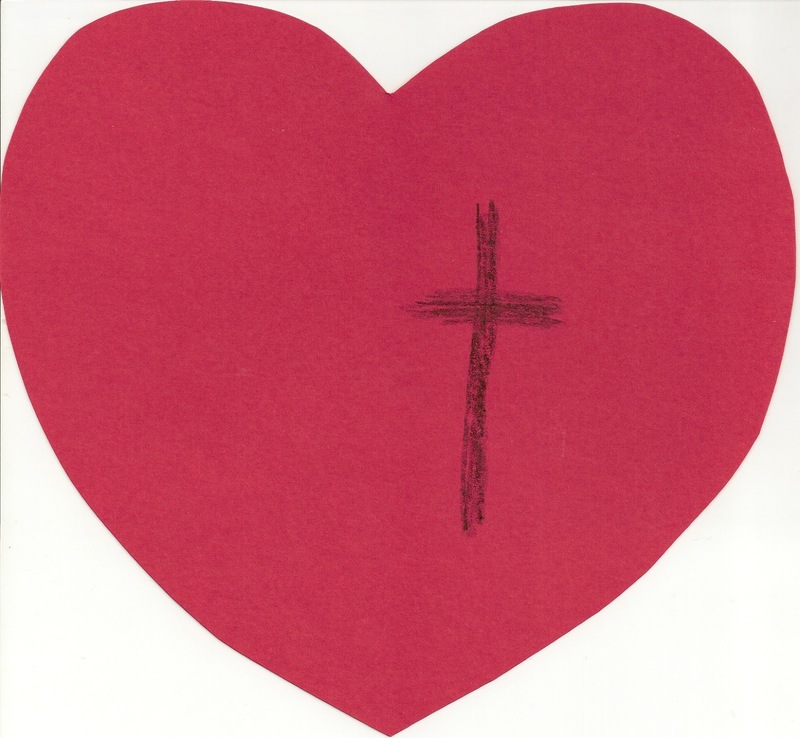 Lent 1 – The temptation of Jesus asks to what we are tempted to give our hearts. Lent 2 – Psalm 27 explores trusting God’s love – even in rough situations. Lent 4 – All these texts are about love that forgives and reconciles. Lent 5 – Mary anoints Jesus’ feet as a loving gift. Paul says knowing Christ is more important to him than anything else. Both love God with all their hearts. Palm – Passion Sunday – The story of Love that keeps going with a broken heart. Maundy Thursday – Love is the main rule. Good Friday – Love sacrifices all and forgives. Easter – Love conquers even death. U It is interesting that the lectionary's Matthew 6 reading for Ash Wednesday omits the teaching about prayer and the Lord’s Prayer . Furthermore, the lectionary omits this text entirely. It just is not there! For that reason, I’d read these verses one year instead of the fasting verses to introduce a Lenten discipline of praying every day. Make it a congregation-wide challenge to pray the Lord’s Prayer every day. Challenge households with children to learn the Lord’s Prayer - if the children do not know it already. 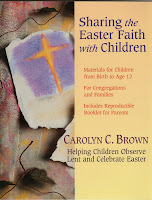 You might even offer a small token to each child who recites the prayer for you during Lent. Families work on this by reading the prayer together each day, by learning one phrase each week to add to the phrases they already know, by passing the prayer around the table with each person praying the next phrase (with help as needed), even posting a copy on the refrigerator door or some other central place. Instead of focusing on the Lord’s Prayer, challenge the congregation to pray in some way every day during Lent. For some households this might mean praying before or after one meal each day. Others might commit to bedtime prayers together. Musicians might commit to a singing prayer each day or to learning a hymn prayer on their musical instrument. To help individuals and households succeed at this, provide resources. One resource is a classic twist pretzel reminder. Look at these pretzels to see the upper torso with the arms folded across the chest and hands folded together in prayer. Pretzels were actually a Middle Ages invention to serve as a Lenten prayer reminder. Give each person or household a small bag of edible pretzels or a hardened clay pretzel made by one or more children’s classes. Either serves as a reminder to keep the commitment to pray during Lent – and even afterwards. Finally, if you serve cookies or gold fish at fellowship time, serve only pretzels for the duration of this discipline. U Instead of hiding an “alleluia” poster for Lent (see Year A - Observing Lent and Celebrating Easter), fold away a beautiful banner featuring the word “Alleluia.” Parade it around on a pole and sing lots of Alleluias on Transfiguration Sunday before Lent . Then, on the first Sunday of Lent, fold it away perhaps in a fine box that is stored in full view under the communion table. On Easter morning shake it out and parade it around with Alleluia songs. Also parade it around and display it prominently on each of the Sundays of Easter. Unless you have Pentecost banners, tie red streamers onto it for Pentecost Sunday. U One way to draw children into Holy Week stories is to create a series of interactive stations. Go to RevGalBlogPals: Outdoor Easter Festival for a description of a four-stop tour done in the church’s cemetery. With Easter so early this year, an outside plan might be a bit risky for those of us further north. But, walking through these stories in a cemetery is loaded with advantages. It places the story in a public death place giving it reality. It gives children a comfortable experience with cemeteries that may serve them well should they make a trip there for a frightening family funeral. It even leaves behind children’s witnesses to the story for all who visit the cemetery in the following weeks. U When the Episcopalian rector moved in next door and talked about “nearly burning down the church” with the Easter vigil fire, he had my attention. Shortly thereafter I attended my first Easter vigil. I loved it! It began with the big fire outside from which the Christ candle was lit. Then inside the darkly candlelit sanctuary we heard, sang and prayed our way through the Bible recalling salvation history. When we got to Jesus’ resurrection, all the lights were turned on revealing a flower-filled church and worshipers rang bells they brought from home while singing an Easter hymn. That was followed by recalling baptism with water being flung over us all, a short Easter sermon and the Eucharist. After the service there was a fellowship hour with all sorts of Easter treats. U I have since learned that this is both a loved and dreaded (because it can run long) service in many Christian traditions. Seeing the whole service with fresh eyes, it, or parts of it, seem to me to offer several wonderful ways to include children in the celebration of Easter. 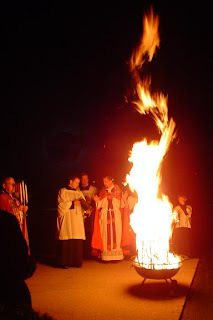 Realizing that I am the Easter vigil newbie and that many of you have life-long experience with this service, I offer the following ideas and hope you will either correct me or add more ideas. Fire, candles, bells, water, bread and cup offer lots of sensory input for children. Though sunrise is still probably the best time for children to experience the Easter story, this vigil on Saturday just after dark has advantages. For starters it is not a school day. So, families who might pass on Maundy Thursday or Good Friday services, are more able to attend. And, since it is not as early as a sunrise service, it does not require prying children from sleep. If the service is planned with the presence of children in mind it is a good opportunity to rehearse the whole Easter story with them in a vivid way. The lectionary readings are rather long and could be pared to the essentials. Some of them could be read from children’s Bible story books. One source hinted at presenting the readings in a variety of formats (dialogs, pantomimes, skits, etc.) rather than a series of straight readings. It would also be possible to create (or have children create in advance) a story pole or banner to process in with each reading slowly collecting a timeline across the front of the sanctuary. Liturgical tradition dictates 7 specific texts that trace salvation history through the Old Testament. But, I am wondering about some years focusing on telling the story of Jesus from Annunciation through Resurrection instead. The Paschal candle is in its element at the evening vigil. (Candles simply do not make much of a statement in a sanctuary filled with morning light.) At dusk, a huge Christ candle is lit from the bonfire. Worshipers follow it into the darkened sanctuary and light their individual candles from it. My mother who grew up in the Orthodox Church remembers following the Paschal candle around the outside of the church three times in the dark to recall Jesus’ three days in the tomb before entering the Easter sanctuary. The candle is placed beside the baptismal font. In some countries, worshipers carry light from the Christ candle home to light smaller Christ candles in their homes. A simple white pillar candle may serve at home. But families may use a nail to carve a cross in the side of the candle, inscribe the date of the year around the cross, alpha above the cross and omega below it. Some may stick 5 cloves in the cross to recall Christ’s wounds. (I am wondering about saving the Christ candle from the Advent wreath to carve and light during Easter.) Crosses in which these figures are painted in wax are also available commercially. Though the Paschal candle is the star of the Easter vigil, it is often part of Easter morning worship and can be offered to Easter morning worshipers for worship at home. Why aren’t there more bells in Easter celebrations?! The Episcopalians brought jingle bells, silver dinner bells, even cow bells to ring constantly as we sang the first Easter hymn. I had the sense some worshipers had searched out the bells for this purpose and rang the same one with relish every year. I even wonder if it would be appropriate to ring the steeple bell, if your church has one, during this hymn. I love your heart idea during Lent. I am going to use it in my children's sermons. I am looking forward to seeing what kind of heart you come up with for each week. I am a United Methodist pastor's spouse who does the Good News for Kids each week in worship and during special times of the church year (Advent, Lent, the 4 weeks before our VBS) I try to do a series of kids sermons. We have a contemporary "in-between times" worship on Easter Eve, filled with blues and jazz music and a sermon that is very meaningful for adults. This year I want to add "something for kids". I want to focus on the darkness and uncertainty of the night, without focusing on fear or being scary. I've thought of a glow in the dark Easter egg hunt, sharing story in a cardboard, battery candle lit tomb, something with a fire (s'more's?) candles. Maybe we will join part of worship and then move to our own space. Any ideas to help enhance, solidify, my Holy Saturday plans would be appreciated! Nicole, what about instead of a cardboard tomb finding the most remote-feeling room in the church and going there, closing the door and turning out the lights (keep the battery candles or lanterns)- just like the disciples did after Jesus was killed. For children the darkness of Saturday night is less about fear and more about the sadness of Jesus being dead forever, or so the disciples thought then. So tell the stories of Holy Week, make up sad prayers and draw sad pictures with only black crayons. If the adult service announces the empty tomb, do so in your upper room service,then bust out for some games outside - maybe glow in the dark sticks to dance with. If the adult service will end on a more somber tone, plan a way to look ahead to Easter morning. (Especially young children can be overwhelmed if they think the story stops here - and some may not show up on Sunday morning to hear the ending.) To keep somber adults and children in somewhat the same place as they leave church, make the glow in the dark egg hunt a quiet hunt - only whispers - because you know the surprise that will come tomorrow, but it has to wait 'til then. Who else has something to add? Thank you Carolyn! I am so grateful for your response. I've posed this question to many others and received little response. I love your ideas about sad stories, sad prayers, and black drawings, plus time in a remote dark room by candlelight.